Raphael – Why the Foolishness? Thanks to our girl Stephanie T. for this hilarious submission to our ongoing WTF – Why the Foolishness? series! 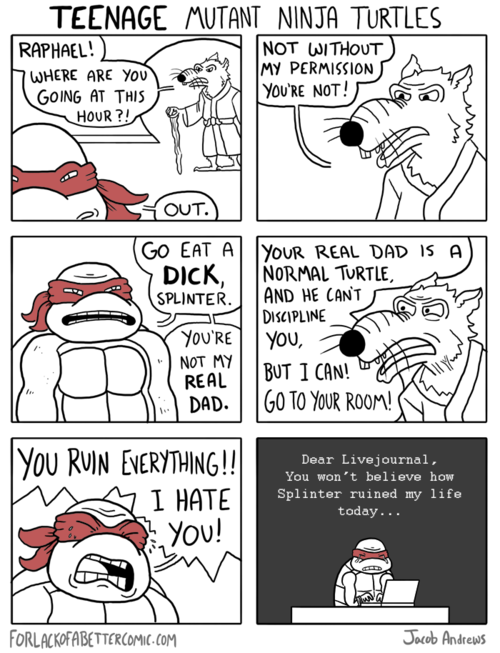 I think this is a reminder that Splinter really must’ve had his hands full with those ungrateful teenage mutant ninja bastards. Posted by tracekilla on April 5, 2012 in WTF - Why the Foolishness? and tagged foolishness, forlackofabettercomic.com, Jacob Andrews, Raphael, Teenage Mutant Ninja Turtles.